On Thursday, April 18, 2018, the House Agriculture Committee reported its version of the farm bill titled the Agriculture and Nutrition Act of 2018 (House Ag Committee Press Release, April 18, 2018). The vote to report the bill to the full House was 26 to 20 and notable because the vote was partisan; no Democrats voted for it, no Republicans voted against it (Brasher, Agri-Pulse, April 18, 2018). The partisan nature of the committee’s initial steps in reauthorizing the farm bill may signal further difficulties for passing a bill in Congress this year. Significant focus has concentrated on three key changes in the bill; revisions to the Supplemental Nutrition Assistance Program (SNAP), elimination of the Conservation Stewardship Program (CSP), and alterations to farm programs, including payment limitations and eligibility requirements. The following is a brief review of the 2018 House farm bill. The Congressional Budget Office (CBO) released their assessment of the changes in spending that would result from the program revisions in the House Ag Committee bill (CBO, Cost Estimate, H.R. 2, Agriculture and Nutrition Act of 2018, April 13, 2018). These CBO cost estimates, known generally as the score, are estimated for the ten-year budget window (Fiscal Years (FY) 2019 to 2028) as compared to the April 2018 Baseline estimates (farmdoc daily, April 12, 2018). 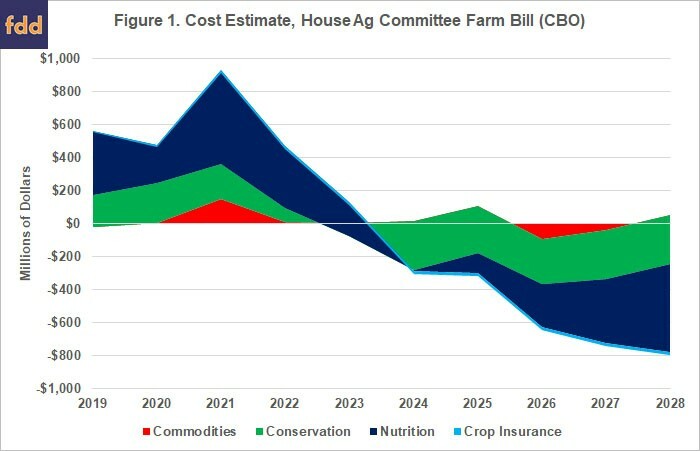 Overall, CBO estimates that the House farm bill will increase spending by $458 million compared to the baseline. Figure 1 illustrates the year-by-year changes in spending for the four major titles in the CBO score. In total, spending on Title I farm programs is expected to increase by $194 million, while spending on crop insurance (Title X) is expected to decrease by $160 million. Spending for Title II conservation programs is expected to decrease by $796 million and CBO estimates that Title IV nutrition spending will increase by $458 million. Looking closer, CBO estimates that total spending will increase by $3.2 billion during the five years the bill would be in operation (FY 2019-2023). Of that increase, $1.8 billion is for nutrition and SNAP, $149 million for commodities and $656 million for conservation. CBO estimates a $70 million decrease for crop insurance. 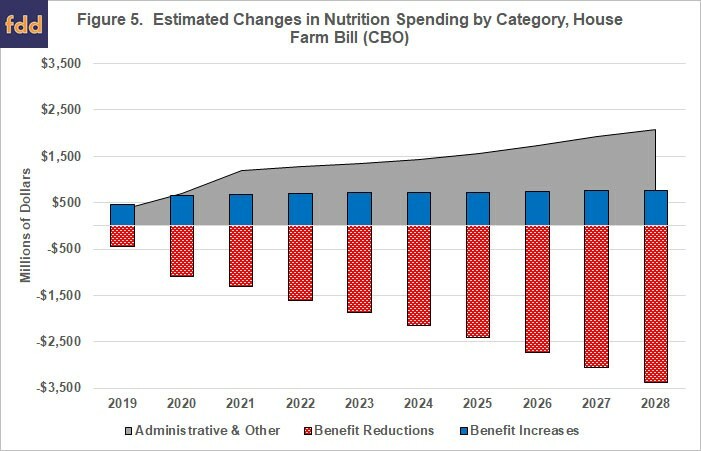 Therefore, most of the scored savings in the bill are expected in the out-years of the 10-year estimate (FY 2024 to 2028) or after the 2018 farm bill would be expected to expire and be replaced by a new bill. 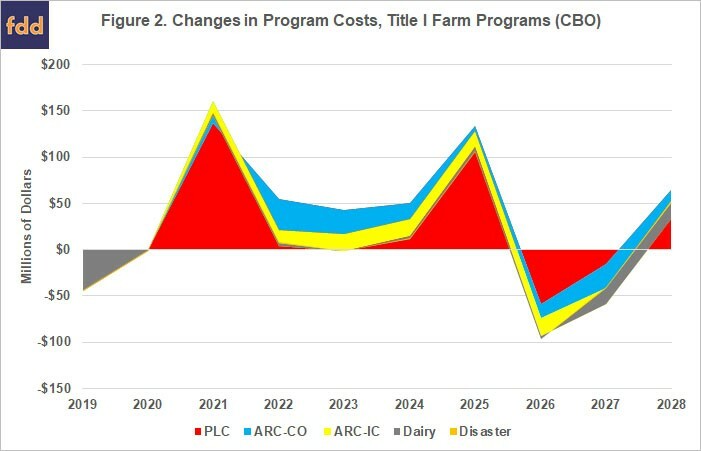 Title I reauthorization in the House Ag Committee farm bill continues the Price Loss Coverage (PLC) program and the Agriculture Risk Coverage (ARC) program but eliminates the individual option in ARC. The changes are focused on PLC and appear most likely designed to make it a more attractive option than ARC. CBO’s assessment indicates as much, with estimates that PLC will spend an additional $408 million but ARC will spend $254 million less than the baseline expectations; a $111 million reduction in ARC-CO, and a $143 million reduction for eliminating ARC-IC. Specifically, the House Ag Committee included a change to PLC that triggers payments based on the effective reference price rather than the statutorily-fixed reference prices. The reference prices fixed in the statute remain unchanged from the 2014 Farm Bill and the Bipartisan Budget Act of 2018 (BBA 2018) that added seed cotton before the House farm bill was released (farmdoc daily, February 14, 2018). The effective reference price is the higher of the statutory reference price or 85 percent of the five-year Olympic moving average of marketing year average (MYA) prices but capped at 115 percent of the statutory reference price. The bill also includes an option for farmers that suffered drought during 2008 to 2012 to increase payment yields used for calculating PLC payments. For seed cotton, this is in addition to the provision that multiplies the PLC yield for upland cotton by a 2.4 factor. Finally, for those farmers who elect ARC, the crop insurance title prevents them from purchasing area-wide revenue insurance policies. The bill generally continues the Marketing Assistance Loan (MAL) program (including Loan Deficiency Payments (LDP)) but CBO does not estimate any changes to the costs of those programs. The bill continues the dairy Margin Protection Program with some revisions to what was revised by the BBA 2018, estimated to decrease spending by $20 million over 10 years. Finally, the bill makes minor revisions to the standing disaster assistance programs costing $11 million over ten years, according to CBO. Figure 2 illustrates CBO’s 10-year estimates for changes in costs for the major programs in Title I. Aside from these programmatic changes, the House Ag Committee alters payment limitations and Adjusted Gross Income (AGI) eligibility requirements in a manner that is likely to be controversial. The 2014 Farm Bill limited all farm program payments to $125,000 per farmer (with a separate $125,000 for peanuts); an amount that included marketing loan gains and loan deficiency payments (LDP). The 2014 Farm Bill also revised AGI eligibility requirements. Farmers with more than $900,000 AGI (averaged over the 3 previous years) in any year would be ineligible for payments in that year, including marketing loan gains and LDP. The House farm bill alters both. For payment limitations, the House farm bill removes LDP and marketing loan gains from the $125,000 limitation. Under this change, farmers would be able to receive unlimited LDP or loan gains. The bill also creates a new category of farm entity called a “qualified pass through entity.” Based on the Internal Revenue Code definition (subchapter K, chapter 1), the term includes partnerships, Limited Liability Companies (LLC), S corporations or joint ventures. This change exempts those entities from the limitations, meaning that farms organized as pass through entities can add persons or entities to the operation which will increase the payments for that operation. Additionally, the bill expands the definition of family member for purposes of payment limits, permitting farm operations to add first cousins, nieces and nephews. Adding these individuals to a farming operation would provide an additional method for increasing payments. The bill also revises the AGI eligibility requirements. First, it eliminates marketing loan gains and LDP from the AGI eligibility requirements. Under the House bill, farmers with AGI above $900,000 (3-year average) would be able to retain eligibility for loans or LDP. The bill also exempts pass-through entities from the AGI eligibility requirement. If a farm is organized as a pass through entity, the House farm bill would allow them to remain eligible for payments even if the entity AGI exceeds $900,000. These provisions, if enacted, would effectively eviscerate the AGI eligibility requirements for any farm organized as a pass through entity. Taken together, these provisions would operate to provide new methods for farms to increase payments, likely to the benefit of sophisticated farm operations. If enacted, these provisions may allow new creativity in this long-contentious matter and depending on how USDA implements the provisions together. For example, would farms organized as pass through entities be able to multiply payments without limit by expanding the number of members, managers, partners or others in the entity, as well as through relatives (e.g., first cousins, nieces and nephews)? These provisions are likely to raise further questions and controversy as the bill progresses through the process. In addition to the change mentioned above for ARC participants, the House Ag Committee farm bill makes minor changes to crop insurance to increase spending for whole farm treatment of beginning farmers and ranchers and for the treatment of forage and grazing. It will decrease spending for Education and Risk Management Assistance, Research and Development, Program Administration and by increasing the fee for catastrophic coverage from $300 to $500. 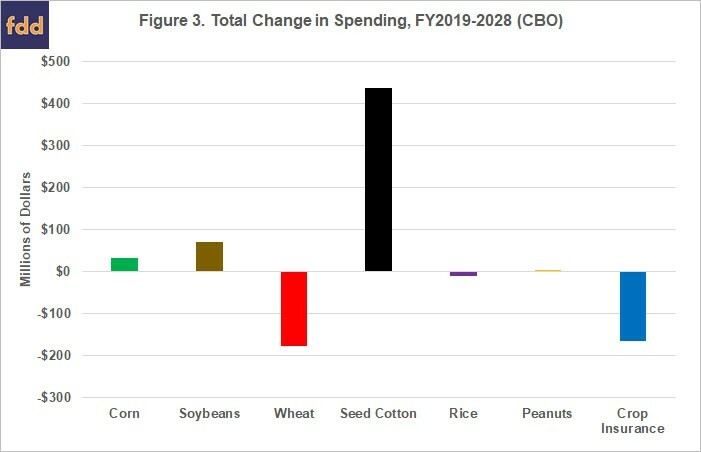 In summary, Figure 3 illustrates the total changes in spending for the major commodities and crop insurance according to CBO’s estimates for the 10-year window (FY2019-2028). It indicates, in particular, the shifting of funds amongst the covered commodities. The crop with the largest gain, according to CBO, is seed cotton. While CBO does not provide further detail on the commodity-by-commodity spending changes, seed cotton likely benefits most from the ability to increase PLC payment yields and by the alterations to payment limits and AGI restrictions which are traditionally more binding on cotton. The House farm bill makes substantial changes to the conservation programs in Title II, most notably it would eliminate the Conservation Stewardship Program (CSP) and increase the acreage cap for the Conservation Reserve Program (CRP). In total, CBO estimates that the bill will reduce spending on conservation by $795 million over the 10-year budget window. 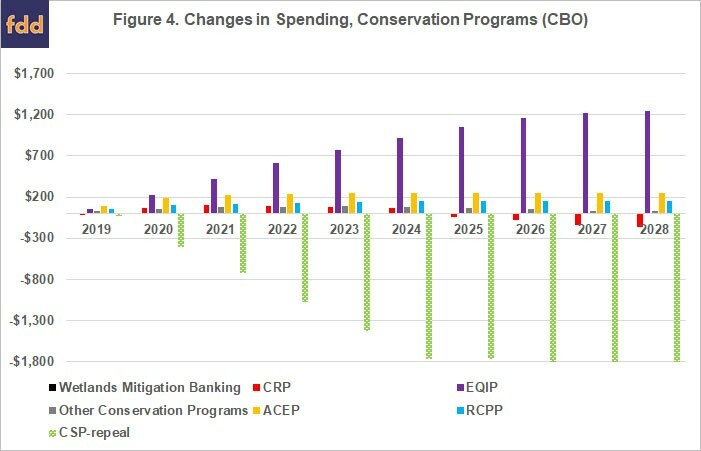 Figure 4 illustrates the changes in spending estimated by CBO by the bill. CBO estimates that eliminating CSP will reduce spending by $12.6 billion over ten years. The bill would add $7.7 billion to EQIP, which also includes new authority to provide for 5-to-10-year contract payments for adopting and installing conservation practices, as well as managing, maintaining, and improving the stewardship practices. The bill also increases funding for the Agricultural Conservation Easement Program (ACEP) by $2.2 billion, as well as a $1.3 billion increase for the Regional Conservation Partnership Program (RCPP) created by the 2014 Farm Bill. The CRP acreage cap steps up from 25 million acres in 2019 to 29 million acres in 2023 (1 million acres per year) but places limits on the rental rates for acres re-enrolled in the program. In general, rental rates for the initial enrollment of acres in CRP is to be capped at 80 percent of the estimated annual average county rental rate. Acres reenrolled in the program for the first time are capped at 65 percent, acres reenrolled for a second time are capped at 55 percent, acres reenrolled for a third time are capped at 45 percent and acres reenrolled for a fourth time are capped at 35 percent of the annual county average rental rates. Based on the CBO score, this appears to have helped reduce the costs of adding acres to the program. Based on the House Ag Committee mark-up, the most controversial aspects of the bill are the numerous changes to the Supplemental Nutrition Assistance Program (SNAP) in the nutrition title (House Ag Committee, Business Meeting, April 18, 2018). Overall, CBO estimates that the bill would increase spending on nutrition title programs by $463 million over the 10-year budget window. Most of the controversy, however, is due to the changes made to eligibility requirements, allowances for energy assistance, and creation of new work requirements. The expected impacts of these changes are evident in the CBO score. In total, CBO scored 23 different changes to the nutrition title programs, including SNAP. Figure 5 illustrates these by sorting CBO’s estimated changes in spending into one of three categories: (1) those that reduce spending on benefits, including through reduced participation; (2) those that increase spending on benefits; and (3) those that add or increase spending on administrative or other non-benefit matters. CBO estimates that the House bill is expected to result in a net reduction in benefits of nearly $16 billion ($23 billion reduction offset by a $7 billion increase) while increasing funds for administering the program by over $16 billion. The provisions that fall under the general description as “workforce solutions” demonstrate this shift of funds and help further highlight the controversy surrounding the changes. CBO estimates that the new requirements would reduce benefits by more than $9 billion over the 10-year window. At the same time, the bill increases spending on the administration of these requirements by almost $8 billion. The House farm bill creates a National Animal Disease Preparedness and Response fund for $450 million and increases spending on international development programs (e.g., Market Access Program and Foreign Market Development program) for creating and expanding export markets for American commodities by $450 million. It also increases funding for outreach and assistance to socially disadvantaged producers, organic research and extension, as well as for beginning farmer and rancher development. The bill creates a trust fund for cotton and wool apparel articles at a cost of over $100 million. Finally, the House farm bill eliminates the energy title that was first created by the 2002 Farm Bill but the energy programs are continued under the Rural Development title (Title VI). Mandatory funding for these programs has been eliminated and the programs would be subject to appropriations. According to CBO, this results in a reduction in spending on bio refinery assistance and the Rural Energy for America Program (REAP) by just over $500 million in the 10-year window. Historically, farm bills have been a political contest more regional than partisan but this began to transform as southern states and districts transitioned from the Democratic Party to the Republican Party (Coppess 2018). The debate that produced the Agricultural Act of 2014 highlighted the political problems for farm bills under this partisan and regional realignment; the Senate featured a traditional regional contest over farm programs; and the House a contentious partisan dispute over SNAP. It is notable that the Senate managed to pass a bill twice on bipartisan votes but the House initially defeated the bill on the floor. With the Agriculture and Nutrition Act of 2018, the farm bill political situation continues to deteriorate. The vote last week marks the first time since food assistance was added to farm bills that one was reported by the House Ag Committee on a strictly party-line vote. The closest historical antecedent was the Food and Agriculture Act of 1962 that was opposed by all 14 Republicans on the House Ag Committee and a handful of Democrats. That bill was defeated on the House floor. Ever southern in its orientation on farm policy and SNAP, the House Ag Committee farm bill marches into this troubled history under a cloud of partisanship and controversy. The House Ag Committee added controversial work requirements and benefit reductions for food assistance recipients while increasing the cost of administering the programs. At the same time, the committee elected to provide farmers with new methods to increase farm program payments and avoid AGI eligibility requirements. It is this juxtaposition of the treatment for farmers–cotton farmers in particular–as compared to low-income families that will likely cause the most problems for the bill and its supporters going forward. It could prove consequential for this and future farm bills if it serves to further damage the larger coalition between farm assistance and food assistance that has historically been necessary to pass a farm bill through Congress. Coppess, J., G. Schnitkey, C. Zulauf, and N. Paulson. “Reviewing the CBO Baseline for 2018 Farm Bill Debate.” farmdoc daily (8):65, Department of Agricultural and Consumer Economics, University of Illinois at Urbana-Champaign, April 12, 2018. Coppess, J., N. Paulson, C. Zulauf, and G. Schnitkey. “Farm Bill Round 1: Dairy, Cotton and the President’s Budget.” farmdoc daily (8):25, Department of Agricultural and Consumer Economics, University of Illinois at Urbana-Champaign, February 14, 2018. Jonathan Coppess, The Fault Lines of Farm Policy: A Legislative and Political History of the Farm Bill (U. of Nebraska Press, forthcoming 2018). Dr. Schnitkey uses Farm Business Farm Management (FBFM) data on revenue and costs to analyze profitability of major field crops and to assess impacts of farm programs and risk management strategies. His research informs farmers of the most profitable rotations and encourages long-term change to impact yield. Associate Professor in the Department of Agricultural and Consumer Economics in the College of Agricultural, Consumer and Environmental Sciences at the University of Illinois. For more information, visit http://ace.illinois.edu/directory/npaulson. Carl Zulauf is a Professor in the Department of Agricultural, Environmental, and Development Economics at The Ohio State University. Dr. Zulauf’s areas of specialization are commercial agricultural policy and commodity futures and options markets.